I participated in an Influencer Activation on behalf of Mom Central Consulting for Vitafusion. I received a product sample to facilitate my review and promotional item to thank me for participating. I’ll never forget the day when I first became a mom. Right from the first few minutes after her birth, I was so focused on getting my daughter to nurse that I didn’t have much time to think about what my own body had just gone through. Then, as I adjusted to an infant’s schedule, I sometimes didn’t get to take a shower until the afternoon because I was taking care of my baby. Even now, many years later, she gets practically a whole new wardrobe twice a year, while I make do with whatever is in my closet. That’s what motherhood is all about…giving of yourself so that your children can grow up healthy and happy. It’s a tough job, but it’s one I wouldn’t give up for anything. Still, we moms are so used to taking care of others that sometimes we forget about ourselves. We need to make sure we are eating right, exercising, drinking lots of water, and filling in the gaps in our nutrition if we want to live a long healthy life for our kids. About two years ago, at my yearly check-up, my doctor asked me if I was taking any vitamins. She was specifically worried about my vitamin D levels, since apparently, I’m now in that age-bracket where you have to start worrying about osteoporosis and such. She ordered a blood test, and sure enough, my vitamin level was low. So now, I have to make sure that I’m taking my vitamins everyday. I started out just grabbing a women’s multivitamin off the shelf at Target, along with some vitamin D and some fish oil capsules (I like to take those because heart disease runs in my family). So every morning, after breakfast, I made it a habit to take my vitamins. But opening 3 different bottles and swallowing down 3 giant horse-sized pills everyday was a little tedious. Then I switched over to Vitafusion’s Heart Support gummy vitamins. Wow, what a difference! Now, instead of fiddling with multiple vitamin bottles each morning, while I’m trying to clean up the breakfast dishes and make sure the kids are getting dressed in time for the school bus, I can just pop two gummy vitamins in my mouth and run upstairs to finish our morning routine. Vitafusion’s Heart Support gummies are not only great-tasting, but they contain omega-3 DHA, along with vitamin D and all the other vitamins and minerals that make up a complete multivitamin. 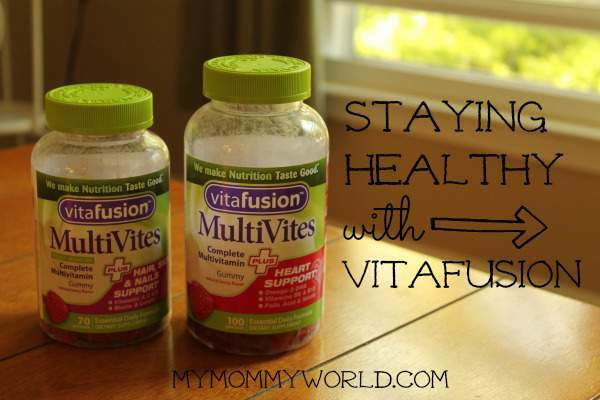 It’s also easy to find Vitafusion gummies, because they are available at most drug, grocery stores and mass-merchandise stores all over the country… I love that I don’t have to make a special trip to the mall to get a trustworthy vitamin! So moms, if there is one gift that you give your children, it is the gift of a healthy mom that will be around for a long, long time. Taking a good vitamin is one easy step toward that goal! Head over to Vitafusion’s web site to check out the complete line of Vitafusion gummies and find the formula that’s best for you! I take the Vitafusion gummy vitamins too. They are so good! They really are! It’s so much more appetizing to chew on a berry gummy than to try to swallow a bitter tasting pill, isn’t it?